In the end, that state of confusion was sustained throughout the exhibition itself and even as far as the book produced in its name. And rightly so. Allan Kaprow – Art as Life treads the same fine line between event and document that Kaprow himself so painstakingly navigated over the course of his lifetime. 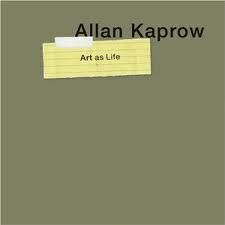 The lifelike art of Allan Kaprow exists not in a gallery nor on the pages of a monograph but in the live, fleeting moments of the happenings, activities and environments he created. To serve his work, the book and the exhibition alike had to hold back from it. The challenge was to foreground the ephemeral experiences themselves, and not the weight of their documentation. The book makes little explicit reference to the particular challenge it raises just by being there. The sheer weight of the tome – 360 outsize pages of thick, full colour stock – makes an unapologetic claim for its own the authority as a definitive contribution to Kaprow scholarship, and its force as an object threatens to satisfy the reader, as though the book might be enough without the artwork. But despite its lavish form, what saves the book is a careful implementation of strategies borrowed from the making of the exhibition. The vast majority of those pages are occupied by an extensive chronology of Kaprow’s prolific output between 1952 and 2007, comprising high quality facsimiles of notes, scores, diagrams, photographs and exhibition ephemera largely taken from the Getty Research Institute archive. These pages also include year-by-year lists of exhibitions, writings, teaching appointments, life events and works produced, accompanied by no narrative description or contextualization whatsoever. Such interpretive detail appears separately beforehand, in six newly commissioned essays that critically and historically situate the body of work in relation to the documents that survive it. The final chapter of essays – The Making of a Retrospective – consists of texts by the exhibition’s two curators, who also co-edited the book with Andrew Perchuk. These two essays set out the particular challenges of mounting the show and outline approaches developed to accommodate them, and in so doing they offer an implicit criteria with which to consider the success of the book itself as a sensitive account of the practice it describes. An illuminating passage from an earlier essay warns that when one “feels ‘finished’ after reading the illustrated instructions or watching the video” of an Activity, one “does not necessarily feel any urge to undertake the Activity to truly experience the artwork.”  It is this demotion of the force of direct experience that the exhibition sought to avoid. It finally presented an intentionally overwhelming quantity of material arranged by media rather than strictly by project, “so that an overview would ultimately exist only in the viewer’s mind”. Likewise, the book includes an excess of documentation in its chronology, the quantity and detail of which is almost impenetrable in the uninterrupted format it takes. Above all this format succeeds in giving the impression that something has happened, or has been happening, without allowing it to happen again for the reader of the book. Though the volume is immaculately designed and exists as a substantial, thorough and pleasing artifact in its own right, it refuses to leave the reader sated. We remain readers: not participants, not witnesses, but those who come after, to watch the work without encountering it directly.